From Wimbledon beating Liverpool to Hereford beating Newcastle to Bradford beating Chelsea, there’s nothing quite like a David versus Goliath. The Women’s FA Cup has had its fair share of romance, too, and this weekend sees fourth-tier Crawley Wasps face 14-time winners Arsenal. An Arsenal that has record-breaking Vivianne Miedema, the world-class Kim Little, the composed young defender Leah Williamson, and a host of internationals and top young talents to boot. 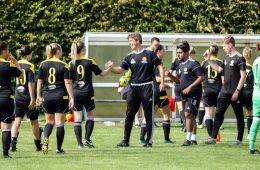 The Wasps were formed 27 years ago and have only ever been a women’s football club. It’s a name which the locals hold dear, a brand which has become synonymous with the side, noticeable in their black-and-yellow striped shirts. Last year they were as low as the fifth tier of English football before earning promotion and the side has a good chance of back-to-back promotions, largely thanks to the efforts of committed manager/chairman Paul Walker.